30 years is indeed a long time, as far as human beings are considered. People's taste can change over night, best friend of today may be the worst enemy of tomorrow. But for hosni Mubarak, nothing changed much for three decades he ruled Egypt - a major country in Arab world, Asia and Afric. Its indeed a miracle that a person was able to rule 80 million people for asuch long period, considering the fact that politician in India are not sure what will happen to them once their term is over. Till 3-4 weeks back no one even thought that all this will end so quickly. But human history is full of unexpected events like the sudden rise and fall of regimes and nations. It was in the form of inspiration from Tunisia's Jasmine revolution, that changed everything. People from Cairo, Alexandria, Suez and many others from different part of the country created history by peacefully bringing down the government. A warning for many people who still thinks that revolutions will come through the barrel of the gun only. 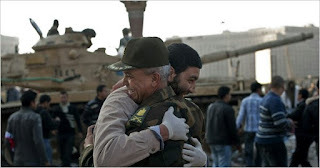 As of now Army assured that, Egypt will continue to honour the international treaties and the current civilian leadership will manage the country's affairs till the next election. Egyptions are celebrating the event accross the nation, after all they are now part of, one of the rare events in Egyption history after independence. They not only bring down the Mubarak's government, but they are also able to bring down fear factor among the people. Common people across non-democratic countries, who once feared to come out and protest against the regime, have no such hesitations the recent days. Its time for caution also; If Egyptions are able to create stable and secular democrcy then it will make an end to the assumptions like - the end of autocratic governments will bring the fundamentalists in power etc. But if it happend otherwise, then the arguments like this will remain as an excuse for all autocratic regimes to stay on power. Indeed the entire world is looking towards Egypt, what will happen next?